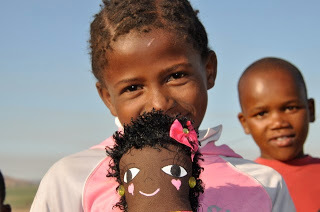 The mission behind Dolly Donations is a simple one; to make a difference in the lives of orphaned children around the world by providing a little comfort and handmade love, one dolly at a time. So far the organization has helped hundreds and hundreds of children around the world, just like the little happy face below. 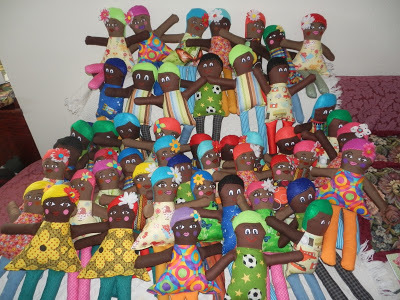 Check out photos of the dear dollies made for children, along with more smiling faces of the children that have received the dolls, at the Dolly Donations “Your Dolly Drives” website page. It’s surprising that such a little thing can bring so much joy! Find everything you need to know about Dolly Donations at the official website: How to help current doll drives , where to send finished dolls, and how to help if you don’t sew. Get inspired to make your own dolls through free patterns, tips, and doll tutorials (see the menu bar along the right side of the website). 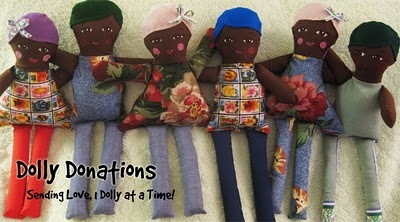 You can even get a group of sewing friends together to create your own dolly drive!